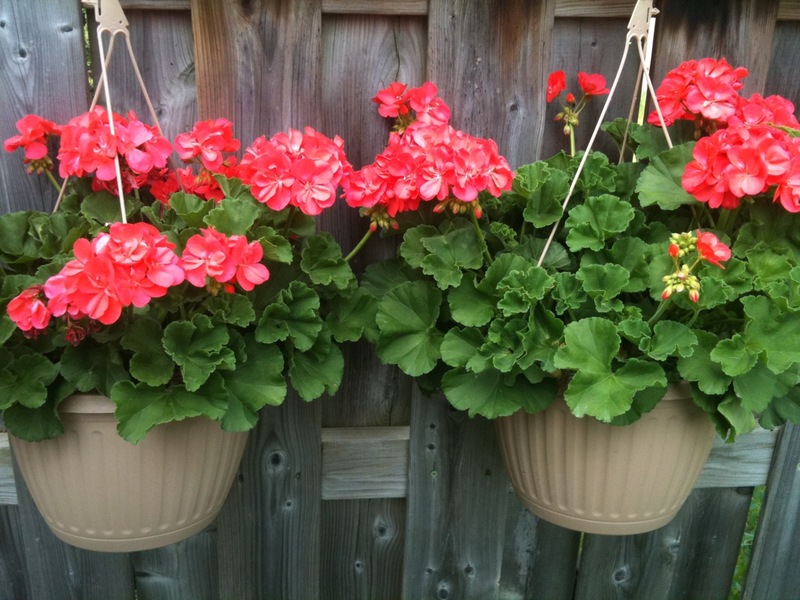 If you are a frequent visitor to this website, you probably already know that I love gardening. I don’t claim to be great at it – most of my gardening skills come from trial and error learning process – but that is sometimes a very good way to learn. I think that you can read all kinds of gardening books, listen and watch gardening shows, but until you actually plant things in your garden, you may not know what is going to work for you and what isn’t. When I started planning my garden, I wanted it to be as natural looking as possible, include plants I liked and grow on its own as much as possible. You are probably smiling right now, but what I mean is that I worked towards including as many perennials and shrubs as possible and only adding annuals to add more blooms and even more colour. I love going to garden centres and believe me, I very seldom walk out empty handed! 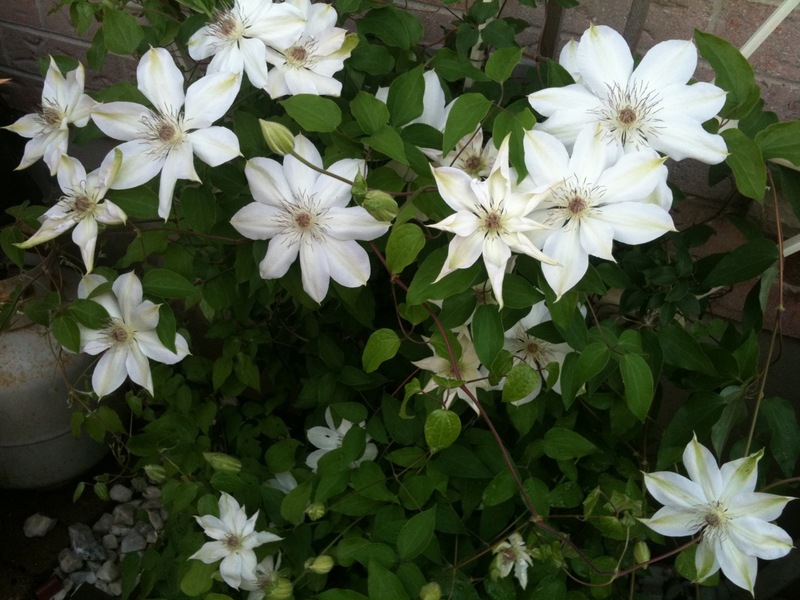 This was the third time I planted Clematis – the previous efforts resulted in dried out plants – probably because of exposure. I planted this one 2 years ago, right next to the walkout from our house and it likes it there. And I love the beautiful and abundant white blooms! 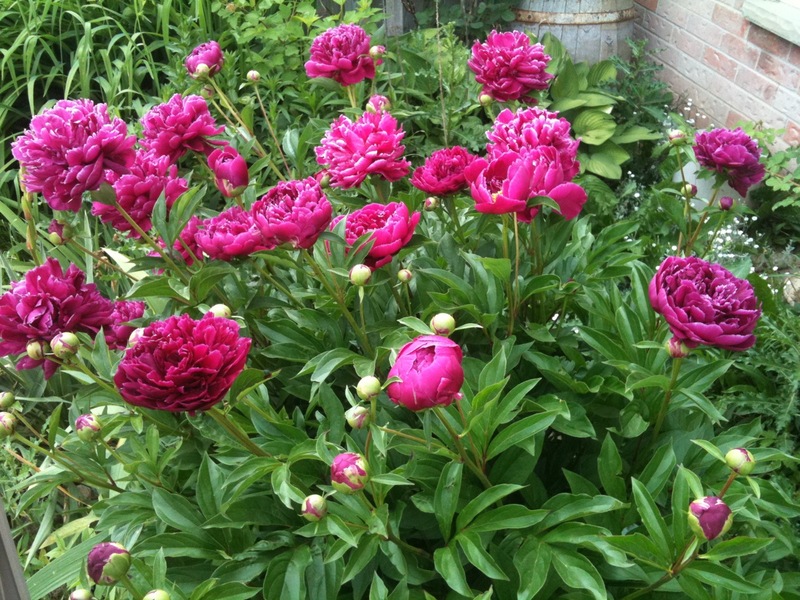 Aside of roses, peonies are one of my most favourite plants. 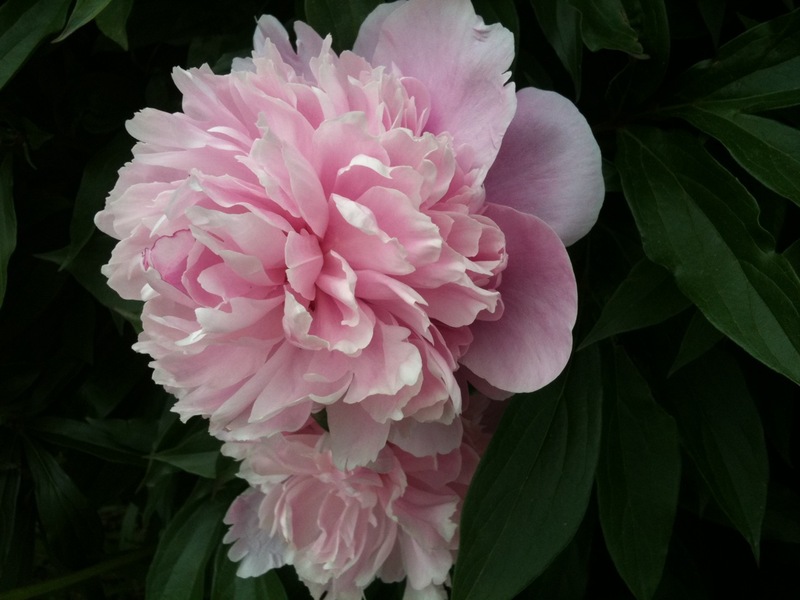 This one is quite old – I think I planted it about 10 years ago. But is is incredible showing off with over 100 blooms every single year. When it starts blooming, I hope it won’t rain too much, because those huge blooms fill up with water and lay down on the ground – and that is pretty much the end of them. It would be nice to have flowers like this all year! 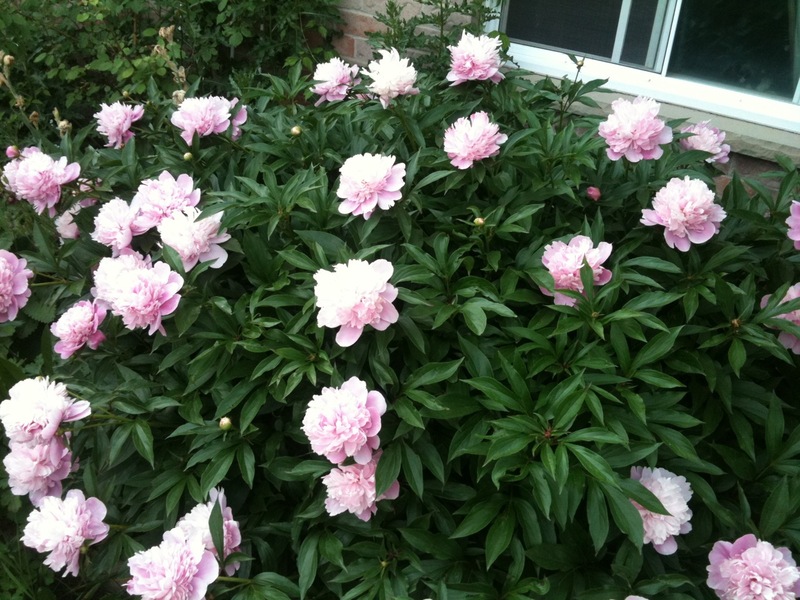 This is my second peony plant – also planted about 10 years ago. This one is a beautiful burgundy shade and it must be a different kind becuase the stacks are stronger and the blooms don’t fall on the ground as easily. Again – I wish it would bloom year round! 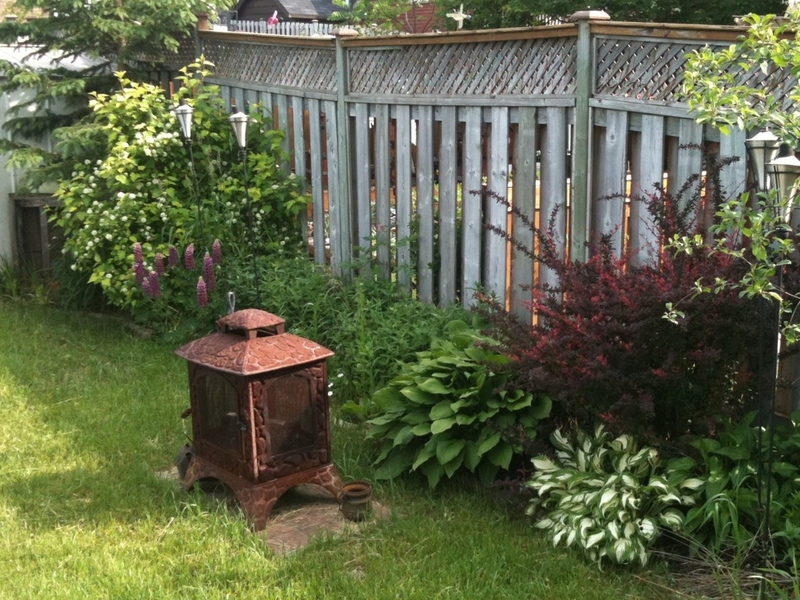 This entire side bed is pretty much carefree – I filled it with perennials. When lupins finish blooming, black eyed susans will start and then other perennials so there are always a few blooms there. The colour is added by the shrub that stays dark red all the time – I do not remember what it is called, I bought it because of the colour and it really works well. And of course – hostas – they do really well for me and I have given lots of them away to friends as well. 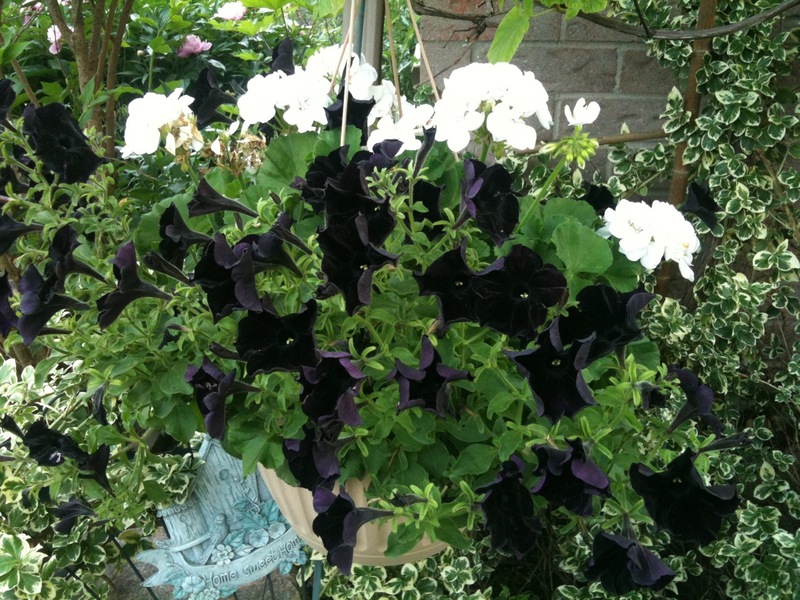 I just couldn’t resist buying this hanging basket – a beautiful combination of black petunias and white geraniums – stunning! 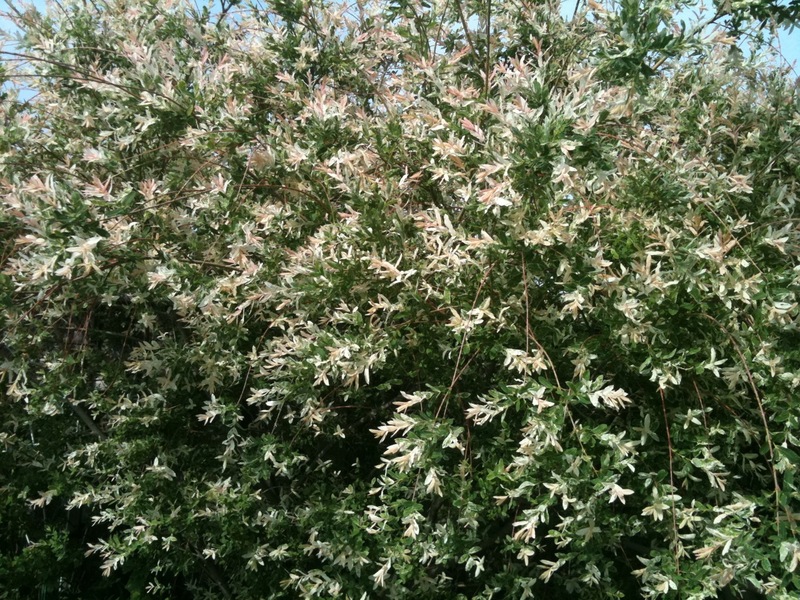 This was a little shrub, about 2 feet tall when I bought it – I am pretty sure it was tagged as “Flowering willow”. It grew beautifully and it always looks like it is blooming. The white and pink colours are actually new growths and everyone who visits my garden admires this beautiful tree. And I suspect that it keeps bugs away -we cut a few branches and had them in a house for a few hours and could smell a funny, almost musty odour coming from them – so it could be an added benefit! You may be taking and second look at this picture, wondering what it is. It my favourite tree, planted about 14 years ago from a small shoot off my friends large tree. 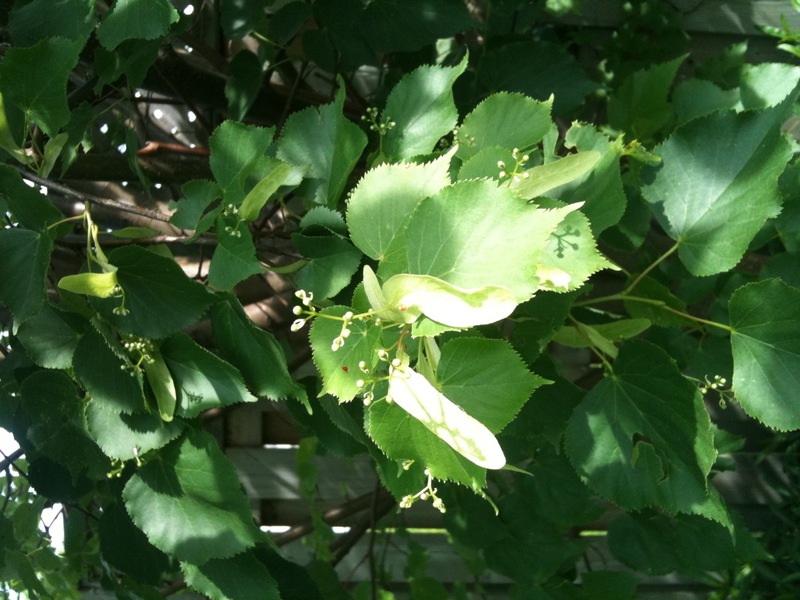 It is a linden tree – the national tree of Czech Republic where I am originally from. I remember my grandma collecting the blooms, drying them out and making this incredible tee that she sweetened with honey. 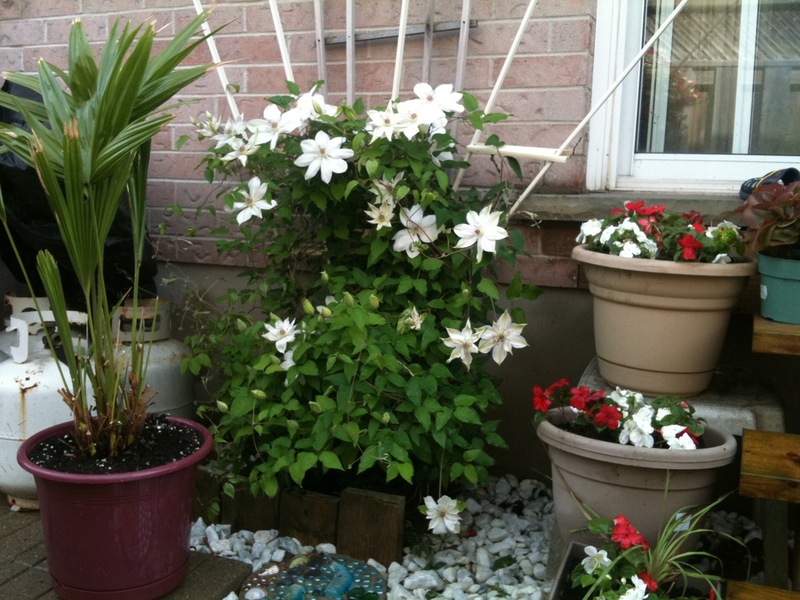 One year soon, I will start collecting the blooms to – just for the old times sake.